It should come as pretty much no surprise that one of my first focal points when getting hands-on time with Final Fantasy XIV: Stormblood was learning the new jobs. 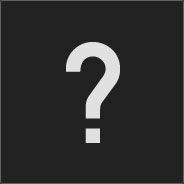 For one thing, I have characters who I want to use these as main jobs; for another thing, these are new jobs, and thus they’ve got new mechanics and all sorts of new stuff. Refinement and a quintet of new abilities just can’t compare to a whole 70 levels of new abilities, after all. Beyond that, I was curious about how they were going to manage the mechanics in general. Red Mage needed to feel like a hybrid melee and caster damage dealer that didn’t exactly mirror anything in the game but still felt related to Black Mage and White Mage both, and Samurai needed to carve a distinct space for itself in the niche of melee damage. So there were question marks. I’m happy to say that I walked away from both eager to play more, however. Both of the new jobs feel like responsive damage dealers with very different tricks, feeling no more powerful than existing jobs but definitely feeling very unique. They fill niches which heretofore had not been filled, and while they may not be exactly what you’re looking for, they deliver on the promise of their names. First things first, and it’s something I am sad to report on: Red Mage’s status as a melee character is entirely a charade. It’s shadowplay, something made to look right with abilities and animations. If you were hoping to spend most of the fight cuddled up to the target in melee range, you will be mildly disappointed; you certainly can, but it’s the equivalent of a Summoner walking into melee range to book-smack the target. It’s not productive. That’s all right, however, because the actual play of the job is fun. It’s all about building balance, timing your buffs, and unloading in a flurry of steel and spellcasting. 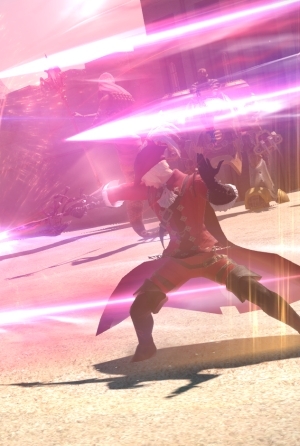 Red Mage is outfitted with an impressive array of spells as well as a three-hit weaponskill combo, a melee charge, and a melee backstep. That four-hit combo also naturally segues into the Verholy and Verflare spells at the highest level, which are further tied into the balance mechanic. It’s all about maintaining your balance, or more accurately, building up your balance. Once you pass a certain point, your weaponskills become empowered and deal significantly more damage; they will, however, also drain your balance gauge in the process. At its core, then, Red Mage wants to build up the balance gauge, swing into melee, and then spring back out. There are five spells which form the core of this rotation. Jolt is your basic attack spell, filling both your black and white gauges a small amount and dealing small but appreciable damage. You also have a basic black magic and white magic attack spell, each of which fills its respective gauge far more substantially and has a chance of buffing you to cast another, more powerful black or white magic spell. Getting too far out of balance will have a detrimental effect on your rotation. However, Verholy and Verflare, as mentioned about, cap off your attack chain, and both of them benefit from you being slightly off-balance. Thus, you want to aim at a slight imbalance with your spells, then go into a rush and spend, then flip back, fire off the right spell, and swap over for the next rotation to start the sequence up again. There’s slightly more to the rotation, of course, as you also have a melee-range weaponskill and an AoE spell with similar functionality to your single-target rotation, but you get the basic idea. It’s about filling and spending while keeping a close watch on your overall balance. Red Mages also have a spot of party utility with a heal and a raise, both of which can be used along with Chainspell if you’re paying attention. I got quite a bit of power out of being able to chain-heal two people in quick succession during periods when I couldn’t be doing much DPS or when our healer was out of commission for whatever reason. It’s not why you’re there, obviously, but you can make good use of it, arguably even more so than a Summoner can. At the end of the day, I’m impressed by Red Mage. The job manages to feel like it’s integrating all of the diverse and somewhat bizarre aspects of the job across its many incarnations, and you wind up with a job that does something distinct from its contemporaries. It feels like it really does wrap all of the messy parts of that job identity up into one package, and that’s no small feat. So, good news, Samurai fans! You have a katana. That sure is a katana. There, are we done? No, we’re not done. Joking aside, there are certain ideas which have managed to be retained over time. Samurai have a degree of mental discipline, and they excel at mastering precision strikes. Unlike Ninja, they don’t veer over into magical territory; instead, their more-than-human tricks are a result of focused effort and action in precisely the right way. In Final Fantasy XI, which is their obvious inspiration, they were perhaps best known for Meditate, which allowed them to chain together a large number of weaponskills and made them intensely powerful as a subjob. Samurai in FFXIV retain Meditate, and it’s a good thing they do, because it’s clearly a part of their core identity. They also inherit some of the nested weaponskill lines that other jobs have moved away from. Samurai isn’t about long combos or shifting forms; instead, it’s about stacking the right combos together before unleashing a perfect strike. It’s impossible to overstate how Samurai combos are different from others. Ninja players are familiar with how all of a Ninja’s combos flow off of a single opening strike right now, and Samurai takes that to the next level. Both the AoE and single-target skills have combos, and each of those combos ends in a skill which unlocks one of the three Samurai symbols. You can then use Iaijutsu to deploy a special attack based on how many of these symbols have been unlocked first. One symbol hits the target with a solid DoT effect. Two symbols deploys an AoE strike. Three symbols is a powerful single-target hit. And from that alone, you can probably guess what the flow looks like. Use a short combo, hit the DoT, use all three combo chains, hit the more powerful strike. Refresh and restart. What breaks the cycle and prevents it from being a rote set of motions are the various uses of the Samurai’s slow-building Kenki power. Kenki can be used for many things – quick charges, melee strikes, self-buffs, and so forth. Thus, you’re not just cycling through your combos, but managing your power and holding it in reserve for potentially needed tools. You also have the aforementioned Meditate, which allows you to execute combo enders without going through the full combo, an obvious tool for building up to Iaijutsu in a hurry. It’s a bit harder to articulate the different between Samurai and the other melee jobs than it is to articulate how Red Mage is different, but it really does feel like a distinct job. It doesn’t have the constant rush of Monk, the long building combos of Dragoon, or the weaving of steel and timing that Ninja offers; instead, it’s much more about managing resources and preparing in advance. Combined with excellent visuals and the sheer visual flavor, and I’m fond of it. Perhaps not quite as fond of it as I am of Red Mage, but you can’t have everything. Disclosure: Transportation to San Francisco as well as lodging was provided by Square-Enix as part of this media tour. That meant I could spend a lot of time sitting around thinking about how desperately I wanted this expansion now after the event was over. Also missing my cats. I contain multitudes. All content described herein is subject to change, as it’s still under development. I wouldn’t mind if Red Mage did actually base melee damage on Intelligence, although that might be messy. I keep trying to talk myself out of going back to this game. I’ve always hated the strict “rotations” that many of the classes have. That’s boring. I’d rather be able to use whatever skill I want where I find it most effective, like in a BDO where I have multiple ways to start and string together combos. I love Red Mage and it’s the only thing that’s interesting me at this point but damnit. A rotation. I can’t do the rotation. You are correct; it was an error which slipped through! (I am, as I believe I have mentioned, notoriously bad at recalling ability names.) It has been corrected, but thank you for bringing my attention to it. Love the FFXIV Stormblood coverage! Looking forward to all the changes coming to the game and Red Mage (mostly) has me coming back. So Samurai is the first melee dps that does not have positional requirements! Woo hoo! Thats my new job then.. Doubt it, FFXIV’s engine actually performs well! Both FFXIV and BDO use their own in-house developed engines, Crystal Tools & the Black Desert Engine respectively. Correct that it’s in house, but FFXIV dropped Crystal Tools when they moved from 1.0 to 2.0 (it was great for single player and cut scenes, not so great for MMOs). It’s an in-house one that shares some similarities with the game engine XV uses, though it’s not the same one as that either. The top picture isn’t actually the game engine, it’s from the Stormblood CGI trailer.